Texas Parks and Wildlife photograph, by Earl Nottingham. 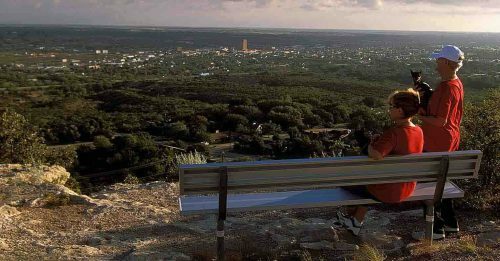 Scenic Mountain marks the western edge of the Edwards Plateau, and its summit, in Big Spring State Park, offers a dramatic view of the vast plains of the Llano Estacado. Travelers on Interstate 20 east of Midland see it from dozens of miles away – a bluff rising 200 feet above the otherwise unbroken West Texas plains. The promontory has always been a landmark. Abundant springs once flowed at its base, and it was a destination for prehistoric bison-hunters, for Comanche raiding parties, and for the earliest westering settlers. Today, it presides over Big Spring, a city of 30,000. The rugged bluff, known as Scenic Mountain, is a treasured community resource. Big Spring State Park is a repository of West Texas history, landscape and wildlife. Big Spring’s identity as a “crossroads” community is woven into its history. It was a stop on the Gold Rush Trail. In the 19th century, it grew as a railroad hub. Oil was discovered in the 20s, and the 15-story Hotel Settles was once the tallest building between Dallas and El Paso. It’s now the center of a resurgent oilfield boom. But at the park, visitors learn it’s a natural crossroads as well. Ron Alton has been park manager for almost three decades. Scenic Mountain is the Edwards Plateau’s western limit, and it shows. Exposed limestone, juniper and prickly pear evoke the Hill Country. But the view from the summit is pure West Texas. Gazing out, visitors survey the vast tablelands of the Llano Estacado. There are white-tailed deer, possums, raccoon. Javelinas visit. Bird life is plentiful. Southwestern species – like curve-billed and crissal thrashers – appear here near the edge of their ranges. Scrub jays flash sky-blue in the brush. Sandhill cranes winter nearby. Alton said it’s a particular thrill to see the massive birds pass over Scenic Mountain. The state acquired these 385 acres in 1934. With local support, crews with the Civilian Conservation Corps – the Depression-era works program – began construction that same year. The men were fed on local beef. But their work was grueling. One stretch of road was hewn by hand in bedrock. But they left a lovely legacy. As at other regional parks – including Indian Lodge in Fort Davis – the CCC used local materials. The park’s headquarters, pavilion and other facilities were built from limestone quarried on-site. They were built to last, and they resonate with the landscape. The CCC initially left the project unfinished. Dr. Phocian Malone, a Big Spring physician, “bombarded” the federal government with letters, Alton said, until crews returned. The city’s namesake springs were long ago pumped dry. But water from the same underground source is diverted to create a lake at Comanche Trail Park, a city green-space adjacent to the state park. Big Spring State Park is a day-use only facility, and admission is free. Malone, the early park advocate, prescribed walks here to his patients, and for many residents a walk on the 2.4-mile road is a weekly, or even daily, ritual. A new hike-and-bike trail is planned. The park is vital to the city’s life. School groups visit. Alton said that, in an oilfield community often at odds with “environmentalism,” those visits can start a lifelong appreciation for the natural world.